You will be given a reference e-book to read which has 780 pages And the test will be based on that e-book , you can take final test within 1 year of purchase. VBScript which stands for Visual Basic Scripting refers to an active scripting language which was developed and introduced by Microsoft to the public. It is primarily designed as a kind of lightweight scripting language which comes with a faster interpreter that you can use in various Microsoft environments. You can use this language in component object model as a means of accessing the elements that run or operate a specific environment such as the FSO or the File System Object which is primarily used in creating, updating, reading and deleting files. One of the major functions of VBScript is to help web page developers to improve their ability in creating more dynamic web pages. HTML is considered by many as not enough to create more interactive web pages. VBScript comes with a lot of tools and features that make it possible for you to create dynamic and interactive web pages like those tools that are designed to easily access the file system of web servers, print current time and date and more advanced tools that are extremely useful for web programmers in their attempt to develop useful web applications. It should also be noted that VBScript is popular for being a general-purpose scripting language so you can expect all its features and tools to be really useful. Among the many features that you will surely enjoy from VBScript are the extended error trapping and strong typing ability. Note that the feature designed to easily pass variable number of parameters to subroutines are already removed. 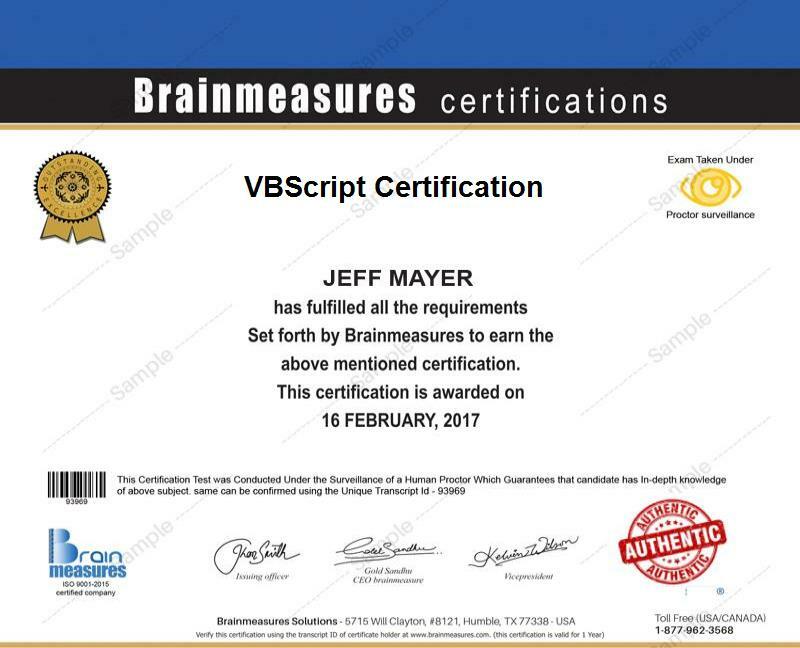 The VBScript certification program which is now available at Brainmeasures is the most ideal online certification course for you if you have longed to become a VBScript expert. This VBScript course works effectively in your attempt to receive the most accurate information about the language and improve your skills in using it. By enrolling in this certification course, you get the chance to undergo the most sought after VBScript training which is guaranteed to work in explaining to you in full detail the most essential concepts linked to the VBScript scripting language, its major components and functions, the most common features installed in it and the many VBScript tools, techniques and features that you can use in developing the most dynamic and interactive web pages. Once you finally take a hold of your VBScript certificate, you will have an easier time informing the public that you are one of the most skillful and competent VBScript experts at present. The benefits offered by the Brainmeasures VBScript certification program to hundreds of individuals and professionals are among its most remarkable qualities. You can expect this certification course to work even more effectively and suitably for all aspiring and existing web and application developers, programmers, consultants, administrators and any other professionals who wish to start taking full advantage of VBScript in effectively performing all their individual functions. Your VBScript certification is also extremely useful in your attempt to start receiving a more stable pay. With the help of your VBScript certification, you will find it easier to get the position of a VBScript developer which gives you the opportunity to receive an average annual salary of $79,000. Using your certification to work as a VBScript application compliance coordinator is also very rewarding because of its ability to let you earn a more stable pay of approximately $93,000 annually.